Even during a period of long term warming, there are short periods of cooling due to climate variability. Short term cooling over the last few years is largely due to a strong La Nina phase in the Pacific Ocean and a prolonged solar minimum. It was the post war industrialization that caused the rapid rise in global CO2 emissions, but by 1945 when this began, the Earth was already in a cooling phase that started around 1942 and continued until 1975. With 32 years of rapidly increasing global temperatures and only a minor increase in global CO2 emissions, followed by 33 years of slowly cooling global temperatures with rapid increases in global CO2 emissions, it was deceitful for the IPCC to make any claim that CO2 emissions were primarily responsible for observed 20th century global warming." (Norm Kalmanovitch). That carbon dioxide causes warming is well established by physics theory and decades of laboratory measurements. This is confirmed by satellite and surface measurements that observe an enhanced greenhouse effect at the wavelengths that carbon dioxide absorb energy. Given the strong causal link between CO2 and warming, what are we to make of periods where CO2 does not correlate with temperature? The most commonly cited example is the recent years since 2002. Over this 7 year period, global temperature has shown little to no trend while CO2 has risen. If CO2 causes warming, shouldn't temperature be rising steadily also? Figure 1: Annual atmospheric carbon dioxide (NOAA) and annual global temperature anomaly (GISS) from 2002 to 2008. However, this is a short period as far as climate trends are concerned. To understand recent years in the broader context of long term climate trends, one needs to look at the temperature record over several decades. By comparing carbon dioxide levels to temperature from 1964 to 2008, it becomes apparent that even during a long term warming trend, there are short periods of cooling. Figure 2: Annual atmospheric carbon dioxide (NOAA) and annual global temperature anomaly (GISS) from 1964 to 2008. Internal variability causes dramatic ups and downs in temperature compared to the more gradual long term trend. Consequently, it's possible to select short periods throughout a long term warming period where the warming slows or reverses. For example, the periods 1977 to 1985 and 1981 to 1989 both show little to no warming while CO2 continues to increase. Taken out of context, one might have concluded in 1985 or 1989 that global warming had stopped based on the previous few years data. Figure 3: Annual atmospheric carbon dioxide (NOAA) and annual global temperature anomaly (GISS) from 1977 to 1985 and 1981 to 1989. What causes this climate variability? Ocean cycles shuffle heat around the climate by exchanging heat between the ocean and atmosphere. This can have a strong short term effect on global temperature, the most dominant cycle being the El Niño Southern Oscillation. In 2008, the Pacific Ocean was in a strong La Niña phase, leading to unusually cool temperatures throughout the tropical Pacific Ocean. Additionally, the sun was currently in solar minimum, experiencing the lowest solar levels in a century. Solar activity has an 11 year cycle which is estimated to have an effect of around 0.1°C on global temperatures. The combination of solar minimum and La Niña conditions would have a short term cooling effect on global temperatures. This demonstrates the danger of drawing conclusions from one small piece of the puzzle without viewing the broader picture. If one focuses on just the last few years, one might erroneously conclude global warming has stopped. However, by looking at several decades of data, we see a climate that shows strong short term variability. By understanding the mechanisms that cause climate variability, we see that the current cooling is short term variation imposed on the long term warming trend. What about a longer time series? Over the past century, are there any periods of long term cooling and if so, what is the significance? Figure 4 compares CO2 to global temperatures over the past century. While CO2 is rising from 1940 to 1970, global temperatures show a cooling trend. 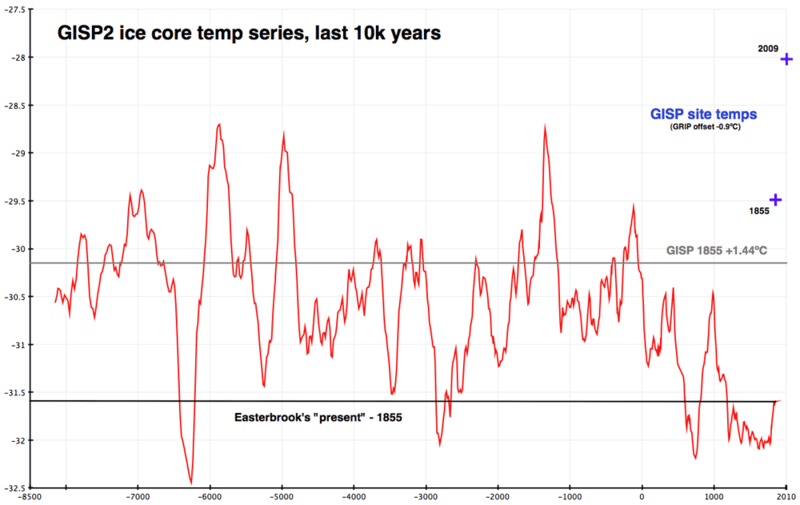 This is a 30 year period, longer than can be explained by internal variability from ENSO and solar cycles. If CO2 causes warming, why isn't global temperature rising over this period? To answer this, one needs to recognise that CO2 is not the only driver of climate. There are a number of factors which affect the net energy flow into our climate. Stratospheric aerosols (eg - from volcanic eruptions) reflect sunlight back into space, causing cooling. When solar activity increases, the amount of energy flowing into our climate increases. Figure 5 shows a composite of the various radiative forcings that affect climate. Figure 5: Separate global climate forcings relative to their 1880 values (GISS). When all the forcings are combined in Figure 6, the net forcing shows good correlation to global temperature. There is still internal variability superimposed on the temperature record due to short term cycles like ENSO. The main discrepancy is a decade centered around 1940. This is thought to be due to a warming bias introduced by US ships measuring engine intake temperature. Figure 6: Blue line is net radiative forcing (GISS). Red line is global temperature anomaly (GISS). So we see that climate isn't controlled by a single factor - there are a number of influences that can change the planet's radiative balance. However, for the last 35 years, the dominant forcing has been CO2. I think that there are a number of issues here. First is the question of correlation, specifically, the degree of correlation between CO2 and warming comapred to other factors. For instance, my understanding is that water vapor constitutes about 95% of the earth's greenhouse gases. But probably more important is the question of causuality. Just because over the last 35-50 years the earth is warming and at the same time CO2 is increasing, might imply correlation but not causuality. I've read studies that in fact suggest the reverse causuality - that over long geologic periods, CO2 increases naturally follow and probably result from the increases in temperature, not the other way around. Next, even if CO2 increases are both correlated to and causual to temperature increases, to what degree is man-made CO2 an effect (since much of the science of climate change is direct input to political decisions around the world). If water vapor is the dominant (95%) greenhouse gas, and assuming that CO2 is the next highest (which it might not be, taking into account methane), then what percentage of that 5% is man-made? From what I've read, that number appears to be around 3%, which translates to a fraction of a percent for man-made contributions to greenhouse gases. But even that might overstate things from a political policy perspective. I understand that a significant percentage of man-made CO2 emissions are directly related to livestock. Glen Tamblyn has been posting excellent rebuttals to the Skeptical Science commenter The Inconvenient Skeptic, over on The Inconvenient Skeptic's site page about the Taylor Dome ice core analysis. That is relevant to this Skeptical Science page (There’s no correlation between CO2 and temperature) because The Inconvenient Skeptic's core argument is that there is no correlation between CO2 and temperature. As commentors and moderators have been pointing out to The Inconvenient Skeptic, his detailed comments on that topic do not belong on the Skeptical Science page The Value of Coherence in Science. Why is it that when I compare the average monthly min/max ratio for 1946 to 2009 for Norfolk Airport Virginia, there is no noticeable change, yet carbon dioxide has virtually doubled? I would expect to see the ratio reducing. Please, share data (for instance 54°F) not adverbs + adjectives (no noticeable, virtually doubled). Your ordered pairs like (1946; 'same same') are not very functional. Links and you transcribing the few significant data will suffice. I would be good to stop replying half cooked comments. For instance, it's easy to choose a couple of years and looking in temperature maps find then a lot of places where temperature have not changed substantially, for instance, as I remember, a third of the Bible Belt for the last 50 or 60 years . But we all know how these sort of 'naive' assertions work, so let the 'innocent' at least to do the work of documenting it. "NOAA/NCDC Annual Global Temperature Change vs CO2 dataset clearly shows ... rising CO2 had little impact"
Utter nonsense. The graph shows annual temperature change, ie T(now) - T(last year). This removes any long term trend and therefore cannot be compared with the long term increase of atmospheric CO2. Any conclusions taken from the website you reference are therefore also utter nonsense. Surely you can do better than a misapplication of basic math and science? Response: [muoncounter] Please restrict image width to 500. My mistake, I forgot to resize the above image to 450 pixels. Mr. Cook, could you please edit the post to fix the problem? Where is this image from? The top graph contains one curve, but is labeled "Air Temperature at the summit of the Greenland ice sheet" on the left and "Approximate global temperature anomaly" on the right. Unless these track exactly (which would seem surprising), something's wrong there. Greenland temperatures wouldn't be useful in comparison. I think the author of the graph should include more recent CO2 values to show that the current spike in temperature is matched by the current spike in CO2. He/She could have used a dotted line similar to the one in the temperature graph. Additionally, I was under the impression that the correlation was only for the latter part of the 20th century (another reason why the author should have included the current CO2 values). Previous to that, I was under the impression that other climate forcings were stronger than CO2; eg, the sun in the early 20th century. As such, it would seem that this graph is a strawman. As you can see, the individual temperature proxies are all over the place, and the GISP2 record (light blue), which shows four of the five highest peaks, is probably the most variable amongst them. Of course, as you can also see, if you take an average of the individual records there is very little remaining variability, compared to that of GISP2 alone. Indeed, taking a multiple proxy mean shows global temperature variability to be confined to a 1 degree C range, not the 2 degree C range Dr Humlum would have you believe. The multi-proxy mean is not the best reconstruction. This is so because it treats individual site specific reconstructions as of the same value as multi-proxy regional reconstructions; and also because of the eight reconstructions used in this case, only two are from the tropics (33% of the Earth's surface), only two from the Southern Hemisphere extra-tropics, in both cases from Antarctica, and the other four are from the Northern Hemisphere extra-tropics. Without this Northern Hemisphere bias, it is likely the reconstruction would show even less variability. As can be seen from the diagram below, Dr Humlum chose to compound the misleading choice of a very variable single site proxy by using global mean temperatures (which because they are a global average have low variability relative to single sites) to represent the modern era. In this way the false impression is created that modern global temperature temperature change is much less than past episodes, whereas modern global temperature are at levels rarely if ever exceeded in the Holocene. Second, the range of CO2 levels over the Holocene as shown by the Epica core is just 20 ppm. A increase of CO2 from 260 to 280 ppm will result in an increased forcing of just , and a temperature increase of just 0.4 Watts/m^2, and a temperature increase of just 0.32 degrees C. That is significant enough, and may well be why the Holocene has not slid into another glacial, unlike the previous inter-glacials. But it is certainly not enough to swamp the many forms of natural forcing, being of a similar magnitude to changes in solar forcings over the last two thousand years, and smaller than changes to volcanic forcings. So, to summarize, variation in Holocene temperature is much smaller than Dr Humlum purports it to be, and CO2 variation is sufficiently small for non-CO2 forcings to be the primary drivers of temperature in the Holocene. Dr Humlum knows this. I wonder why he does not mention it? This is a response to a comment on the Skeptic/ Denier thread. J Bob - I don't understand why anyone would use a local/ regional temperature record for such a comparison when there are others with global figures. It also has the great advantage of displaying aerosols (and other forcings) as well as GHGs. [DB] Thank you for setting a great example! "You asked why I used local temps instead of global? The reason is that there where no “global” temperatures prior to 1850, if you would call it that. Even in 1850, almost all were in the Northern Hemisphere. But there were quite a number of individual station records starting in 1659, so one has a longer time span to compare one variable (temperature) to another (CO2), hence the use of Ave14. You will notice I included the HadCRUT NH as a check on Ave14, and the patterns do seem to track, especially when both are compared to CO2. Both Ave14 & HadCRUT showed strong variations, while CO2 showed none. If I added a HadCRUT global plot, it would appear to change nothing. Your plot, you referenced by Meehl, uses models, and again show little compassion of GHG to temperature, except they both go up over time. I don’t see the up and down motion that would give stronger correlations. This process is my idea of a skeptic." 1) First, any sensible comparison between CO2 and temperatures should compare CO2 forcing with temperature as CO2 and its forcing are not linearly correlated. 2) Although CO2 forcing is considered to be a factor prior to 1950, it is not considered to be the dominating factor by anybody prior to that time for short term (< millennial) time scales (see figure 5 above). Therefore we do not expect a strong short term correlation between CO2 forcing and temperature prior to 1950. 2a) Because of that, temperature fluctuations prior to 1950 are not direct evidence against the greenhouse effect. They are interesting evidence of the scale of natural variability, but using a regional temperature record is inappropriate for determining that variability for reasons given in 9 above. 3) Once all GHG forcings, anthropogenic aerosols and volcanic aerosols are all taken in to account, the decadal correlation between forcings and temperature is remarkable (see figure 6 above). The correlation of annual variability is poor because annual change in CO2 forcing is small, and because annual variation is dominated by the El Nino Southern Oscillation. J Bob "...referenced by Meehl, uses models, and again show little compassion of GHG to temperature, except they both go up over time. I don’t see the up and down motion that would give stronger correlations. This process is my idea of a skeptic. My thought currently is "Oh bother!" Once upon a time I had a lovely little display showing changes in nighttime temperatures in early 20th century. Can't find it (I'm sure some very thoughtful person will eventually direct me to the right place.) 'Twould be handy for one point I might make. Without it, I'll stay mum on that one. As for thinking about your "idea of a skeptic", I'm not so sure. The up and down squiggles you're looking for could just be the 'noise' from various natural variation or they could be those familiar roller-coaster dips we see after major volcanic eruptions. My first response as a skeptic would be - why do the people who know more than me about this stuff not consider it the same way I've been thinking about it? Read a bit, or a lot, more. Then decide whether I understand it well enough to see what they're getting at - or decide I've spent enough time on it and just accept it until someone comes up with the brighter, shinier, clearer version. your 4 point argument has a few problems. 1-Nothing was stated about linear correlation, or linkage between CO2 & global temperature being linear. And if you have ever worked on non-linear systems, most do respond to input changes, such as aircraft stall, or even ferrous transformer cores (except in full saturation). 2-So why was CO2 not considered a dominant factor prior to 1950? Seems to be a giant leap of faith, like in 1950, CO2 woke up. Although it’s a convenient point, since global temperature was bottoming out from the 1942-1955 ~0.45 deg. C (HadCRUT3gl) dip. 3-Even the Krakatau eruption in 1883 didn’t seem to phase the global temperature, with all the material dumped into the atmosphere, nor did it seem to effect the Lawdome CO2 data. Nor did CO2 change during in the 1880-1910 (HadCRUT3gl) 0.5 deg. C dip, or the longer 1775-1860 (Ave14). 4-I looked at NH data, since that is where most of the long term temperature data sets reside. As far as gases mixing, I assume the gas diffusion law still works between the NH & SH, so CO2 distribution should be pretty uniform globally. The one area we might agree on would be the increase in particulates in the atmosphere, such as the Asian Brown Cloud. Here is a higher resolution graph. 1) There has been an increase of CO2 from 285 to 390 ppm since 1850, or 37%. Over the same period the forcing from CO2 has increased from approximately 30 W/m^2 to 31.7 W/m^2, or 5.7%. Running a direct comparison between CO2 and temperature therefore significantly distorts expectations of the effect of CO2 forcing. Your insistence on making a comparison known to be misleading rather than one known to be accurate is not a problem with my argument. Rather, it is a problem with your credibility. 2) Comparison of estimated forcings for all well mixed Green House Gases (second column) compared to the direct and indirect aerosol effect (second last and last columns respectively) show that until about 1950 they are always close to balancing each other out. Occasions when they are not quite in balance either coincide with exceptionally cool periods when the aerosol forcing is stronger (1910), or rapid warming when the GHG forcing is stronger (late 30's). After 1950, and particularly after the mid-1970's, GHG forcings begin to exceed aerosol forcings on a consistent basis. 4) Long lived components of the atmosphere like GHGs are well mixed between SH and NH. Short lived components like aerosols are not. Consequently the SH has a similar GHG forcing to the NH, but a much reduced aerosol forcing. It therefore provides a natural experiment which better quantifies the effect of CO2 forcings. That is straight forward enough. That you prefer a temperature record where we expect a maximum contaminating effect from aerosols (Europe) and at the same time refuse to factor in aerosol forcings into your calculation is very telling. J Bob, you do realise that particulates are included in aerosols? yes, from 1959. Principles of Heat Transfer by Frank Kreith, p.211, section on Radiation from Gases, Vapors & Flames. you quote a lot of estimated data based on math models. It would be better if you used actual data. I'm not thrilled about proxy data from ice cores, but it gives a sense of assurance if corresponds to actual measured data. I don't think I'd bet the farm on estimated model data.Those charts I presented above, can be traced to actual data sets, as well as some of the CO2 data. Somehow I feel more comfortable with some actual test data. I've seen what can happen when models go wrong, due to limited evaluation. J Bob @16, Translated: You want to treat the experiment as containing a single variable when you know they contain multiple variables. In item 6 above, charts of CO2 and Temperature are displayed for the last 11,000 years. Despite imperfections that have been pointed out for those charts, it is reasonable to ask the question "Where is the correlation between CO2 and Temperature ?" The same question applies for similar charts drawn for 1850 to 2011. From 1940 to 1975 temperature decreased while CO2 increased. From 2000 to 2011 CO2 has continued to increase but the rate of temperature increase has declined. For the 12 months of any year CO2 varies by much less than the un-correlated, larger variation in temperature. The data shows no correlation between Temperature and CO2. Charts of the measured data show that temperature is affected by other factors more than it is affected by CO2. I don't know how many systems you had to identify, with multiple inputs, output (MIMO) & parameters, when many of the inner workings were not well defined, and non-linear. One of the first things you do, is vary a single input, and then note the output response. You continue to do this with all the inputs, in order to gain an understanding of what is going on within. As you gain experience, one starts to look at multiple input changes, and subsequent responses. This is not an experiment, this is real life. J Bob, you have to use proxy data because you dont have any other reliable set. Your situation is 19 is ideal but that's not the real world. All variables are varying at the same time so you need multivariate tools. tobyth2 - see CO2 is not the only driver of climate. You only expect the correlation when CO2 is the primary forcing. The better question to ask is, since climate theory predicts temperature change to be a function of all forcings in operation, how well is temperature (on climatic scales of 30 year average) predicted by those forcing. Answer. very well indeed. You seem to have experience and understanding with complex systems. You should of course, then, understand that the climate is a complex system, and that teasing out an exact, easily recognized CO2 to temperature correlation would be a fool's errand, correct? You would not expect to have done this with the systems with which you have experience, correct? Yes, but the only place where this can be done is in models (which is another subject). In real life there are some very clever ways to do this, by for instance studying the short term responses to volcano eruptions, or paleoclimate data, or other clever ideas. But overall, this simply isn't possible. This is a different kind of problem than you are used to, and requires a different sort of thinking. Precisely. And for this reason, meeting your insistence on a direct correlation between CO2 and temperature is simply unrealistic. That doesn't mean that CO2 can't be doing what it does, it only means that your demand for impossible proof itself proves and disproves nothing. J Bob @19, I am quite aware that the procedure for identifying the effects of particular independent variable in a multiple variable system is to determine how the dependent variable changes as you change one independent variable while holding all others constant. You in contrast are comparing one independent variable to the dependent variable while simply ignoring the other independent variables. Not only that, you insist on making your comparison where an unmonitored (by you) independent variable is known to have fluctuated by a great deal. "For the 12 months of any year CO2 varies by much less than the un-correlated, larger variation in temperature. The data shows no correlation between Temperature and CO2." Frankly I'm surprised he didn't also mention the daily variation in temperatures. Just imagine, it was 5 degrees C at 4:00 am this morning, and now its 25 degrees C and the CO2 content of the atmosphere has not changed at all: therefore CO2 is irrelevant to the Earth's temperature. Is that the sort of argument you like? It sure looks like it from this position. you say "All variables are varying at the same time so you need multivariate tools". True, I had a feeling I should have kept my MATLAB & System Identification Toolbox. Used it several times. Have you ever used it? No. That is not a toolbox that I have heard of. I seldom need that kind of statistical analysis and would look to R instead of MATLAB for the tools if the statistics Toolbox wouldnt cover it. (That said, it does have multivariate tools but I have never used them). However, that's the approach of the Benestad paper. MATLAB is an analysis software package that leans toward matrix analysis decomposition. It is used extensively in industry. It has a number of "toolboxes", that range from Statistics, Process control systems, Image processing, finance, etc. It's not cheap, but it does do a pretty good job. One of the better features is the "linking" of different "toolboxes" as needed, as well as the Simulink simulation package. you say "And for this reason, meeting your insistence on a direct correlation between CO2 and temperature is simply unrealistic.". That sounds "skeptic" to me. It's not that there is not a connection between temperature & CO2, (as noted by atmospheric absorption bands), but how much, and under what conditions. So at this time, as I said before, I wouldn't bet the farm on proxy and model results. We might have to wait a few more years to see if there truly is a global temperature plateau, and note the corresponding GHG data to prove or disprove the model predictions. J Bob. I use MATLAB all the time. Just never heard of "System Identification" toolbox. Note I said " R instead of MATLAB for the tools if the statistics Toolbox wouldnt cover it" - I am well aware of the statistics toolbox in MATLAB. Just more likely to go to R for non-trivial stuff (or more honestly, hand them R experts here instead). From what I've seen, deniers focus on graphs of very recent events, but seem to forget the one time in Prehistory that is similar to what's happening today. The Permian mass extinction was caused by CO2 releaced from a massive flood-bassalt eruption in modern-day Siberia. This caused a chain reaction of events that involved anoxification of the oceans, release of frozen methane from the sea floor, and the desertification of almost all of Pangea. 95% of all species died. It was the biggest extinction in the history of the earth... so far. Looking at temp-CO2 correlations is a bad idea for the very fundamental reason that temperature indicates the accumulation of forcing, so there is an integration between flow (CO2 forcing) and stock (heat or temperature). In general, you can't expect to see a correlation between a flow and stock time series, even when causality is perfect. It happens that some relationship is evident for CO2-temp because the time constant of surface heat is fairly short, but this is not terribly informative. This topic gives the impression that it's OK to look for temp-CO2 or forcing-CO2 correlations, if you just look for them the right way. It would be better if the message were that looking at stock-flow correlations (CO2-temp, or worse, emissions-temp) is basically misleading, unless you explicitly consider the dynamics. I return to the fact that you should not make the assumption that I know nothing about climate warming - and you would learn more if you asked questions about what my beliefts are. Carbon is only one of MANY forcing elements in climate. And the IPCC has been spectacularly wrong on many of them - and even admitted the same. Such as, for example the importance of aerosol formation on clouds. The importance of ionizing radiation for aerosol formation. Finally, I return to a question I asked several weeks ago. When the temperature of the ocean increases, the solubility of gasses decrease - something known as Henry's law or Boyles law. This causes the oceans - when they get warmer - to release massive quantities of CO2 (and O2 etc). The opposite is in fact, not proven. In other words given increased CO2, AGW says that ocean temperatures increase. The observable fact is that increasing temperatures correlates with increased CO2 concentration. But it doesn't say a damn thing about causation. Can you restate my point here so that I can confirm you understand it?" [TD] See the post "CO2 is Not the Only Driver of Climate," noticing the relative contributions of various forcings. By "ionizing radiation" I'm guessing that he/she means cosmic ray influence on clouds; see "It's Cosmic Rays." Notice there are multiple tabs--Basic, Intermediate, and Advanced. Regarding oceans: Of course climatologists know that the CO2 absorbing capacity of the oceans decreases as the oceans warm. However, oceans continue absorbing until they reach a fairly high temperature. And a counterforce is that the oceans also absorb more CO2 as the amount of CO2 in the atmosphere increases. Climatologists figure all that into their calculations. We know that currently the oceans continue to absorb, not emit, CO2, because (a) the oceans continue to acidify (i.e., become less alkaline) as a consequence of their CO2 absorption, and (b) the oceans absorb the bulk of CO2 from human activities, along with all the natural emissions of CO2: See here and here. Causality of CO2 versus temperature was established when the mechanisms were understood (via experimentation) back in the 19th through mid 20th centuries. Observations of global temperatures confirming those theoretical projections were made decades later, when global observations were sufficiently capable. The exact mechanism by which CO2 warms the oceans was determined later, but again with experimentation. The fact that temperature increase causes CO2 increase in no way undermines the fact that CO2 increase causes temperature increase; see "CO2 Lags Temperature" and also "Warming Causes CO2 Rise." "If you take an atom of CO2 in the lower atmosphere and it absorbs energy and reradiates it - molecules can be modelled as radiating energy in all 360 degrees. Part of that energy gets radiated back to the earth (around 36% in the lower troposphere) and part gets radiated to space. (I'm simplifying, ignoring the convective, conductive etc elements of energy transfer between atoms, reradiation etc). As you ascend the atmospheric column ipast the troposphere, several things happen. a). The arc of reradiation to the earths atmosphere decreases (to a very small number - less than 1%). And the amount reradiated to space increases. (Virtually all). b). The contribution of convection, conduction decrease as well to almost zero, and the contribution by radiation dominates (due to concentration of molecules, primarily). So, by the time you get to the outer atmospheres, CO2 is no longer acting to warm the planet. In fact in the outer atmosphere, the amount of energy absorbed from IR emitted from the eart is for all intents and purposes - zero. Instead, in the outer atmospher, CO2 is energized (and in fact is almost always a plasma in some strata) by much more energetic radiation. And CO2 serves to reradiate this energy back into outer space. This is proven born out by the fact that the energy density of solar radiation at the outer edge of the atmosphere is roughtly 1347 per meter square. And the aereal density at the earth's surface is much less than a quarter - the rest of the energy (simplification) is reradiated to space. So in fact, by the outer atmosphere, CO2 is acting to COOL the planet. In the previous thread, I provided links to the study by Nasa that confirmed this finding, and confirmed that they would have to reconsider the NET effect of CO2 on global warming (warming in the low atmosphere, cooling in the high atmosphere)." [TD] First, he needs to revisit his geometry; CO2 molecules would have be to pretty darn high for "nearly all" of their emitted radiation to go to space. Here is one explanation of how CO2 cools the stratosphere while warming the troposphere: "Stratospheric Cooling and Tropospheric Warming." tkman0... It sounds like your denier-guy has a bunch of accurate facts but is interpreting entirely the wrong way. For one, the IPCC isn't getting things "spectaculary wrong." They're merely putting out a report on the current science. If he wants to claim the IPCC is misinterpreting the research, I would have to say, I don't hear a lot of climate researchers jumping up and down about these supposed errors. Your denier-guy correctly states that there are many forcings that act on the climate system. I'd have him watch Richard Alley's lecture "The Biggest Control Knob" which explains the science of why CO2 is the biggest (but not only) factor controling global temperature. Another weird one here: "This causes the oceans - when they get warmer - to release massive quantities of CO2 (and O2 etc)." Etc, etc. He's getting his knickers in a knot merely because he doesn't understand that CO2 can act as a feedback (as with ocean warming/glacial-interglacial cycles) but can also act as a forcing (as with burning fossil fuels). Your description seems about right to me. At the surface (where we live) CO2 causes warming. In addition to the angle of emission, energy emitted upward is usually reabsorbed by another CO2 molecule at a higher altitude. This enhances the warming. Since the troposphere is cooler the higher you go, the higher molecule emitts less energy. As CO2 concentration in the atmosphere increases, the hight in the troposphere where the energy can escape to space becomes cooler. This is the basis of the greenhouse effect. This post on hte greenhouse effect might help a little. The stratosphere is also cooled as you describe. This is one of the key predictions of greenhouse theory and demonstrates that the warming is caused by increased greenhouse gases and not the sun. There is no significant transfer of energy from the stratosphere to the troposphere so the cooling effect in the stratosphere has no significant temperature effect at the surface of the Earth. This effect was predicted decades ago. Most of the energy that reaches the outer edge of the atmosphere reaches the troposphere. Half of the difference between the 1347 and the about 270 w/m2 at the surface is caused by the fact that half the Earth is in darkness all the time (the night side) so you have to devide 1347 by 2. Much of the rest of the difference is due to the fact that the remaining 675 W/m2 is a square meter perpendicular to the sun and the surface of the Earth is round so most does not receive the light directly. About 1/3 of the light is reflected by clouds. Scientists studying climate (the IPCC) have measured all this. While some energy is emitted from the upper atmosphere by CO2, the net effect on the surface of the Earth is warming. Much of the reflected energy and the energy emitted from the stratosphere has always been emitted. It is the changes in energy flux casued by changes in CO2 that we are interested in. Those energy fluxes cause the surface warming. "...you should not make the assumption that I know nothing about climate warming..."
From what follows, the assumption seems well warranted. "... Such as, for example the importance of aerosol formation on clouds. The importance of ionizing radiation for aerosol formation." "Whether ... solar-induced heliospheric modulation of galactic cosmic rays (Marsh and Svensmark, 2000b) also contribute indirect forcings remains ambiguous." "Changes in solar activity affect the cosmic ray flux impinging upon the Earth’s atmosphere, which has been hypothesized to affect climate through changes in cloudiness. Cosmic rays enhance aerosol nucleation and thus may affect cloud condensation nuclei production in the free troposphere, but the effect is too weak to have any climatic influence during a solar cycle or over the last century (medium evidence, high agreement) . No robust association between changes in cosmic rays and cloudiness has been identified. In the event that such an association exists, it is very unlikely to be due to cosmic ray-induced nucleation of new aerosol particles." Now, either your interlocuter thinks Svensmark's hypothesis is falsified, and was falsified as of AR4 (in which case they have indeed corrected an "error"), or he is completely misrepresenting the IPCC, presenting a stronger rejection of the hypothesis as being a correction of prior rejection of the hypothesis (which does not exist). "... This causes the oceans - when they get warmer - to release massive quantities of CO2 (and O2 etc)." Absolutely it is a known fact. What is uncertain is the exact ratio of increase in atmospheric CO2 per degree C increase in Global Mean Surface Temperature (GMST), as other factors are involved. We can quantify it approximately, however, by the 100 ppmv increase in CO2 for an approximately 5 degree C increase in GMST between the last glacial and the Holocene. That gives an expected increase of 20 ppmv in atmospheric CO2 per degree C. Alternatively we could quantify it from the 10 ppmv increase in atmospheric CO2 during the MWP, although a massive human cause deforestation may interfere with that calculation. In either case, it is clear that this effect is not adequate to explain even half of the increase in CO2. Deniers hide that fact by referring to Boyle's law, but never quantifying the details. It is as though they have something to hide, and know it. Even worse for your interlocuters argument is the fact that CO2 concentration in the ocean has been increasing. His theory predicts that it would be decreasing. Further, the decrease in proportion of C14 in the atmosphere indicates the source of the CO2 is C14 free, ie, like fossil fuels, and unlike oceanic CO2. Indeed, six out of 10 lines of empirical evidence preclude oceanic outgassing as being the source of the excess atmospheric CO2, with another two lines of evidence providing contrary evidence, but not decisively so. "If you take an atom of CO2 in the lower atmosphere and it absorbs energy and reradiates it - molecules can be modelled as radiating energy in all 360 degrees. Part of that energy gets radiated back to the earth (around 36% in the lower troposphere) and part gets radiated to space. (I'm simplifying, ignoring the convective, conductive etc elements of energy transfer between atoms, reradiation etc)." Your interlocuter is ignoring absorption and reradiation of emitted energy. Therefore his claim purports to be based purely on geometry. For only 36% of the sphere to be occupied by the Earth's surface, the angle from the closest point of the surface to the limb of the planet as seen from the point of emission must be 64.8 degrees. Given that the radius of the Earth is 6,371 km, it follows that the point of emission must be 670 km above the Earth's surface. Given that the troposphere only extends from 10-20 km above the Earths surface, your interlocuter's definition of the "lower atmosphere" is bizarre to say the least. Indeed, it only just avoids being in the exosphere, the layer of atmosphere from "700 km to the Moon's surface", a layer higher than most satellites. The later 1% claim is even more outrageous. It requires an altitude of 196,458 km, approximately half way to the moon. In fact, as you rise in the atmosphere, more and more radiation does escape to space - but that is entirely due to the decreasing atmospheric concentration rather than to changes in the subtended arc of the Earth's surface. Further, the proportions he quotes are pure fictions. "So, by the time you get to the outer atmospheres ..."
Does your interlocuter think the Earth has more than one atmosphere? Given the absurdity of some of their other errors, it is hard to be sure what is mistyped, and what is another fallacy. What your interlocuter says from there on is reasonably close to true. It is only true of the Thermosphere, however, ie, the atmosphere from 50 to 800 km in altitude. At that altitude temperatures vary rapidly as the result of energy being dumped into the atmosphere from solar flares. That energy is then rapidly reradiated away, primarilly by CO2, with about 90% going to space and 10% to Earth. The effect is to buffer the Earth, reducing the increase in temperature at the Earth's surface from increased solar activity. The effect has nothing to do with the greenhouse effect, which occurs in the first 30 km of the atmosphere. Above that, atmospheric concentration is to low to have much of an effect. It certainly does not falsify the greenhouse effect which has been experimentally observed and shown to exist in no uncertain terms. Thank you very much for your assistance Tom, I'm an 2nd year Environmental Science major in university right now and while climate and resource management is my focus, it helps to have a seasoned researcher assist me in dealing with this denier. tkman0 @36, de nada! I do need to correct a misapprehension. I am not a researcher, let alone a seasoned researcher. tkman0... Don't let Tom fool you with his humility. He is probably the best informed non-researcher I've ever had the pleasure to come across. While actual researchers are likely to have a deeper understanding of their own area of the science, Tom probably has the broadest knowledge of climate of anyone I've seen. When ever I look at the air temperature data, my eye always falls on the two upward trends, from 1910-1943 and 1970 to 2001. I keep finding myself thinking they have pretty much the same slope and the same duration. I cant help but thinking they may not have a common cause. When I look at the modeling results of natural forcing only, like in the intermediate rebuttal of the 'models are unreliable page', niether period is modelled well. The man made forcing only model only captures the second increase. CO2 levels and increases are quite different in these two periods. I realize that weather and climate data can be variable and can make one imagine things, but has there been any kind of study comparing these two periods? Razo @39, yes there has been such a study. Many of them, which are summarized in the IPCC. 3) Durring the late twentieth century warming, volcanic forcing and solar forcing were both negative relative to preceding decades, while anthropogenic forcings were strongly positive. Razo wrote "I cant help but thinking they may not have a common cause." that is pretty irrational, given that we know that both anthropogenic and natural forcings have changed over the last century, and that neither can explain both sets of warming. So for that hypothesis to be correct, virtually everything we know ablut natural and anthropogenic forcings must be wrong. Personally I'd say the hypothesis was wrong. "When I look at the modeling results of natural forcing only, like in the intermediate rebuttal of the 'models are unreliable page', niether period is modelled well." It has already been explained to you that this is likely an artefact of the baselining. The fact that both periods are reasonably well modelled by including both natural and anthropogenic forcings kind of suggests that the two periods do not have a common cause. "but has there been any kind of study comparing these two periods?" Try the IPCC report, the chapter where the figure was taken from is a good start. Linear 'fit' to the last 38 years of ocean data yields 0.3 watts/m^2. Essentially the same as the Livitus et al results. This is ~93% of global warming power with a decent average time. Note this is only about 1/10 of the global warming power claimed by IPCC to reach 3C in a century. SOMMERSWERD - See CO2 is saturated for a discussion of this. The real effects of greenhouse gases take place in the upper atmosphere when the concentrations drop to the level that IR can escape to space, and increased levels of CO2 just raise that altitude. There is no 'saturation' issue. My question was simple but you have not responded. No discussion; just a question that you do not respond directly. [PS] KR pointed you to a more appropriate thread for discussion of question. It is off-topic here. Please take the discussion there. Offtopic discussion will be deleted from this thread. SOMMERSWERD - Actually, I did answer your question. Atmospheric absorption is concentration and hence pressure/altitude dependent, with sea level pressure and concentrations of CO2 absorbing all CO2 frequencies in a matter of meters. What matters for the greenhouse effect is at what temperature (and hence rate) IR is emitted to space - that occurs at altitude, when there is insufficient CO2 above the effective emission altitude to absorb the majority of the outgoing IR. Increasing CO2 simply raises the effective emission altitude - and there is in fact solid data showing that over the last 50 years the tropopause where the effective emission occurs has risen a few hundred meters. Given the lapse rate relationship, that altitude change accounts for the observed rise in temps over that period. So in detail the answer is "it depends on what you're asking". All CO2 frequencies get fully absorbed at the surface (with corresponding thermal emission), the strongest absorption lines continue to absorb a majority of the IR at those frequencies until pressure drops enough to allow >50% through to space, and changes in CO2 concentration simply change that altitude - where again >50% of the emitted IR at those wavelengths escapes the atmosphere. Your question "...how much energy remains to be affected?" is therefore somewhat meaningless without more context. SOMMERSWERD - ...And your question is in fact a query about CO2 absorption saturation, which is more appropriately dealt with on the appropriate thread. The global temperature did not increase from 1940 to 1970. [PS] Read the article. (Net forcings, see figures 5 and 6 on the intermediate version of the article). Warning: Asking questions without any interest in the answers is simply sloganeering and forbidden by the comments policy. from 1940 to 1970. Could you tell me what is the main cause of it? [PS] From the article, "If CO2 causes warming, why isn't global temperature rising over this period? To answer this, one needs to recognise that CO2 is not the only driver of climate. There are a number of factors which affect the net energy flow into our climate. Stratospheric aerosols (eg - from volcanic eruptions) reflect sunlight back into space, causing cooling. When solar activity increases, the amount of energy flowing into our climate increases. Figure 5 shows a composite of the various radiative forcings that affect climate." Figure 5 shows all the factors other than CO2 affecting climate of the period and Fig 6 sums all them, positive and negative, to show little net forcing till 1970. Please take some time to study actually study and understand the figures. Ken @49, your question is answered in the thread "CO2 is not the only driver of climate". Quickest to go to the comments column there, and see Bozzza's (@20) laconic quote: "aerosols" ~ which is the short story . . . that could be expanded slightly to: "increasing industrialization produced reflective aerosols which counterbalanced the rising CO2, until the ever-higher CO2 levels overpowered the aerosol effect by around 1970 [combined with some clean-up of aerosol emissions]. You will note Tom Curtis's (@21) longer explanation of additional factors which contributed to a "flat" 1940-1970 record.